Did Captain John McKay Float a Bottle Note as the Manistee Sank? Judge Halmor Emmons Built a Country Home in "Swampy Ecorse"
Lenny and Olly Avoid Stinky Socks! A flying Dutchman is a ghost ship that is doomed to sail forever. The Western Reserve and the W. H. Gilcher steam forever toward their sheltering ports, but never arrive. In the late 19th Century, ships on the Great Lakes with wooden hulls were proving to be unequal to the task of hauling heavy cargo like iron ore and they could only be built to a certain size. 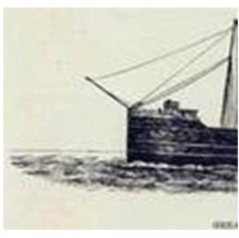 Ship building companies began to produce experimental vessels with iron and steel hulls. Cleveland Shipbuilding led the construction with the Western Reserve built in 1890 and the W.H. Gilcher in 1891. Both ships had steel hulls, both were longer than a football field, and both were two of the largest ships of their era. Both ships surpassed the expectations of their owners for speed and efficiency. The Western Reserve, owned by the Peter Minch family of Cleveland, Ohio, immediately proved its effectiveness in carrying loads of iron ore and the Gilcher, owned by the Gilchrist Shipping Company of Vermilion, Ohio, immediately captured the grain carrying record by transporting 113,885 bushels of wheat from Chicago to Buffalo, New York. Two captains are important figures in the Western Reserve story. Captain Benjamin Truedell tossed and turned in his bunk at the Great Lakes Life Saving Station at Deer Park, Michigan. He couldn’t shake off a vivid dream and he didn’t know what to do about his dream. Captain Truedell had dreamed that he saw the Western Reserve sink, taking its passengers and crew to the bottom of Lake Superior with it. Captain Truedell’s dream was so real that later he recognized Peter Minch’s body when it washed up on shore near Deer Park. A pragmatic and serious man, Captain Truedell hesitated to share what he considered his fanciful dream with anyone.He didn’t try to stopThe Western Reserve from leaving Cleveland. The Western Reserve steamed out of Cleveland bound for Two Harbors, Minnesota to pick up a load of iron ore. The morning of August 30, 1892, found the Western Reserve bucking against a summer storm on Lake Superior. In addition to her regular crew, the owner Peter Minch, his family, guests, and the Captain Albert Meyers and his sons were aboard the Western Reserve. At about 9:00 p.m. that evening, a sudden jolt shuddered through the hull and the mainmast crashed to the deck. Forward of the spar, a break appeared in the deck, and the break widened with the passing of each wave. The crew launched the lifeboats. One wooden boat held Peter Minch, his family and some crew. A metallic yawl held the rest of the 27 people aboard. The yawl capsized, and the lifeboat picked up two survivors. The 19 occupants of the lifeboat bailed and drifted in inky black Lake Superior for ten hours. Within a mile of shore, a wave suddenly capsized the boat and all but one man drowned. Twenty six of the twenty seven people aboard the Western Reserve drowned. Reburial and Reform Harry Stewart, the wheelsman, and the lone survivor struggled ten miles along the desolate and uninhabited Lake Superior coast to reach the Deer Park Lifesaving Station. News of the tragedy spread by word of mouth and by telegraph. Bodies from the lost ship began to wash ashore, and the Deer Point Lifesaving men buried them above the wilderness beach in solitary graves with just a simple prayer for a funeral service. As the weeks wore on, most of the Minch family members were removed from their simple shoreline graves and taken to Cleveland for a permanent resting place. Criticism as harsh and powerful as Lake Superior breakers swept over the owners and builders of the Western Reserve, and investigations questioned the safety of steel ship and lifeboat construction. Tests were conducted and review boards ruled that the Bessemer steel used in building the steel hulled ships was too brittle. New laws for the testing of steel for shipbuilding were subsequently passed. Lake Superior produces mountainous waves and fog around off of Deer Park, Michigan, in all seasons of the year and the Ghost Ship the Western Reserve has been seen gliding across the waves all in all seasons of the year. On warm, calm nights the sounds of voices and laughter can be heard across the gently rolling Lake Superior waves. Two months later on October 28, 1892, the Western Reserve’s sister ship, the W.H. Gilcher, left Buffalo, New York, carrying a cargo of coal and bound for Milwaukee. Captain Lloyd H. Weeks of Vermilion, Ohio, commanded the Gilcher. The Gilcher passed through the Straits of Mackinaw and into storm swept Lake Michigan. Unlike the Western Reserve which had carried no cargo and traveled in water ballast, the Gilcher was ideally loaded for heavy weather. The storm peaked in the late afternoon and early evening. During the light of the next day, the weather calmed and ships let their protective anchorages for their ports. The Gilcher failed to arrive in Milwaukee. Passing ships sighted wreckage that was believed to be part of the Gilcher and some mariners speculated that it had collided with a smaller ship called the Ostrich. The entire crew of 21 sailors sank to the bottom of Lake Michigan with the Gilcher. News reports of the day noted that the Gilcher was last seen when it passed Mackinaw on its way through the Straits at 2:20 p.m. on Friday, October 28, 1892. These reports were incorrect. The Gilcher can still be seen mysteriously appearing through the fog off Mackinaw Island exactly as it appeared on that fateful day in 1892. When shafts of sunlight piece the fog, the figure of Captain Weeks at the wheel appears and the sound of a fog whistle skips across the waves like a stone. The History of the Great Lakes, Vol. I., J.B. Mansfield, Chicago, J.H. Beers & Co., 1899. The History of the Great Lakes, Vol II. J.B. Mansfield, Chicago, J.H. Beers & Co., 1899. The Sault Ste. Marie Democrat, September 1892.